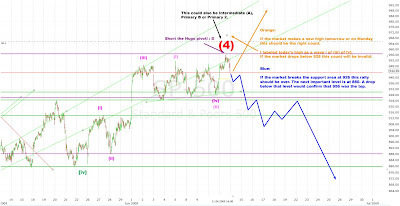 Technical Analysis and Elliott Wave Theory: Blue or orange? Well, the market hit my pivot today and sold off afterwards. I sold all my calls today at 952 as the rally could be over. A drop below 924 confirms the blue count. The next important support level is at 880. If the market drops below that level the current rally should have ended at 956. Wave i of (iii) ended today at 956. Wave ii should correct to 940-945 before wave iii of (iii) starts to reach new highs. This count is invalid as soon as the market drops below 928.